It all started back in September, with Channel [V] rolling out a list of possible candidates for the coveted position of Channel [V] Oz Artist 2010. Then in mid-October, fans were asked to vote on the four finalists – Amy Meredith, Bliss N Eso, John Butler Trio and Short Stack. Having worked with Short Stack in the past and experienced their (let’s say) ‘dedicated’ stack of followers, we knew that Amy, Bliss and John might have a hard time getting things over the line. 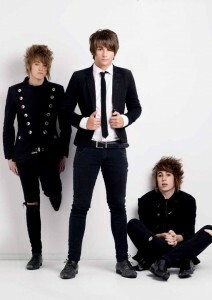 So… After thousands of entries from all over the country, Channel [V] is thrilled to announce today that Short Stack – those cheeky chaps Shaun, Andy and Bradie – have been officially crowned [V] Oz Artist for 2010! To celebrate their win, Short Stack are currently smack bang in the middle of Circular Quay in Sydney for an exclusive Channel [V] Guerilla Gig, belting out songs including ‘Shimmy A Go Go’, ‘Planets’ and their latest single ‘We Dance To A Different Disco, Honey’.